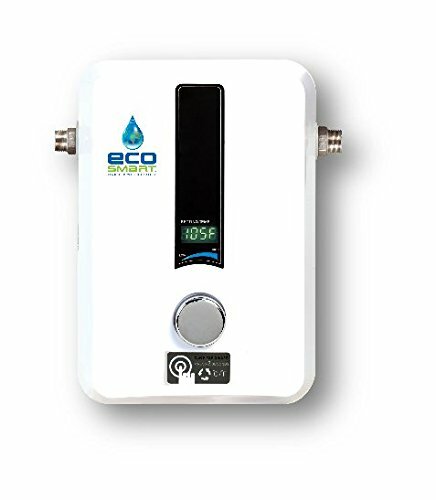 EcoSmart’s tankless water heaters come highly recommended not only because of its affordability but largely for its performance which is backed with sophisticated technology. And the EcoSmart 11 kW Tankless Water Heater reflects that. While it is used for light loads, you may take a shower and use the dish washer at the same time without any problems. This 11 kW tankless, which belongs to the ECO series, is best suited for climates with at least 67oF incoming water temperature. It can heat up to 2 gallons per minute (GPM), or one 1.5 GPM flow shower head and a kitchen sink. Temperature adjustment is easy because the digital dial allows you to change the temperature by 1o increments. There’s also a remote control that’s sold separately if you wish for additional convenience. This unit can be used in colder climates as point-of-use heaters. Similar to other models in the series, this unit requires power: 60 amps from a double pole circuit breaker and #6 gauge copper wires. Check your existing electrical circuits for fit; otherwise, you will need to modify your current set up. The unit is smaller than an Xbox; thus, it can fit in your closet space and even leave you more space for your other stuff. While it may be a bit pricier than its counterparts, it is still affordable at under $220. Just like other ECO models, it is 99.8% energy efficient, which means you save 60% in water heating costs. In dollar terms, you can save on your electricity bills by as much as $70 per month. Because of the self-modulating technology which is proprietary to EcoSmart, you get consistent water temperature. This technology allows the unit to adjust automatically to the output temperature without using excessive energy. This compact water heater has replaced larger capacity units and still meets the needs of the owners. Be sure to check your requirement in terms of gallons-per-minute to ensure that you are using the right model. Who wouldn’t be pleased with the lifetime warranty? But you will need a licensed electrician and plumber to certify it; otherwise, the warranty will not be valid. The following aren’t really “not so good”, but it bears reporting because owners have noticed them. One customer cited that the unit is not powerful enough for point-of-use. It may be that the owner didn’t consider his water demand requirements; hence, this particular comment. Before purchasing, check whether this particular model is the best fit for your needs. You can contact EcoSmart’s customer service and they will be happy to guide you. The unit is designed for use with separate lines for hot and cold water. If you only have one line for both, you will need a restrictor to restrict incoming cold water to get hot water. One owner did this via the piping. It was also recommended that a restrictor for a shower head be used if there’s a similar issue. After this modification, the unit will perform as expected. We highly recommend the EcoSmart 11 kW Tankless Water Heater. It is a good investment and you will see that the savings more than make up for the price you initially spent on purchasing the unit. Also, EcoSmart has the best customer service who’d patiently find solutions should issues arise.